This post is part of a series on problems I've encountered with financial advisers and my day 2 blog post for the #YourTurnChallenge. This article may contain affiliate links; there's a possibility I could earn income when you click through one of these links and sign up for an account, make a purchase, etc. This article is written for entertainment purposes only and should not be construed as financial or any other type of professional advice. As I have mentioned before, I won't say that we had clear financial goals, beyond stability and wealth preservation. We were looking (and paying) for insights that could guide us as we made decisions about our investments. We also wanted to know how those investments could best be managed as we navigated life, including raising children and eventually paying for their college educations. We did receive some valuable information; however, the price of the plan was out of sync with its value. Except for one piece of advice, the plan was somewhat general, though customized for our spending patterns and planned career paths. Years later, the corporation that oversaw the development of these plans settled a class action lawsuit charging that its representatives sold generic plans as customized. Honestly, distinguishing a highly personalized plan from a general one that has been customized may be difficult, particularly for the untrained eye. You really need to see multiple plans prepared for clients with varying goals, risk tolerances, spending patterns, etc. to discern whether a plan has been personalized for your unique circumstances. Also, is it terrible for a financial adviser to use a template? 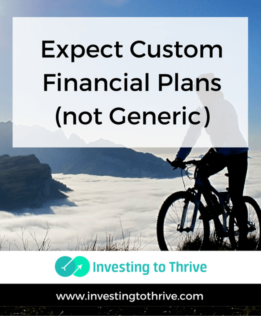 A general plan may be okay if the client realizes that it's a generic plan. But the marketing of a generic plan as a highly customized one is wrong. What I needed then from a financial professional was a creative yet sound and feasible approach to dealing with various financial and life issues. I've discovered that the best way to identify these approaches is to learn as much as possible about financial products, income taxes, and investing; understand and articulate my own unique situation; and pose the right questions to the right type of financial professional. The adviser we consulted (and another who had even more credentials) tended to offer general direction based on common attributes of their clients. When I explained my family's unique circumstances, they were unable to devise a viable solution. Here's an example of a creative way to tackle a problem in the realm of life insurance. This idea comes from Tony Steuer, CLU, LA, CPFFE, and insurance literacy advocate who I have consulted for personal-finance articles. Let's say you are young, married, and are anticipating your first child. Before the child is born (if not before), you take out a $250,000, 30-year term life insurance policy that is adequate but not excessive coverage for your family. A few years later, you decide to buy a home and borrow $250,000 over a 15-year term. At this point, you realize that you need extra life insurance coverage. You could ditch the old policy and get a new one valued at $500,000, which seems like a reasonable solution. However, Tony gave me the idea that you could purchase term life insurance that would cover the term of the mortgage; that is, you could buy a 15-year term policy with a value of $250,000, giving you coverage while (most likely) holding down your insurance costs, plus not requiring you to restart the contestability period for your insurance policies. My experience, which may not be the norm, is that most professionals won't offer creative solutions unless pressed. But I think that creative solutions are just what a financial adviser should offer from the start, if being paid for personalized advice. I'd also check credentials. Note that those who have securities and insurance licenses are qualified to sell securities and insurance but may not have the skills to develop a comprehensive, customized financial plan. These folks may indicate that they have broader capabilities in planning. They may know a tad about planning. But generally they are trying to sell commission-based products that they believe (or want you to believe) fit within this overarching plan. Next time, I look for a financial plan or guidance on planning, I'll consider hiring a Certified Financial Planner (CFP). Before making the call, I'll get a handle on what I want to accomplish. And, I won't hesitate to evaluate the adviser's ability to offer custom solutions to my personal circumstances.